This is a recording of the presentation I gave at the Softshake Conference in Geneva in October 2013. In this presentation I live-code a Pebble app from scratch and send it messages from a corresponding Android App. I share my experience and insights creating an experimental Evernote client for the Pebble watch. How do you deal with writing code in C, with no malloc available? What do you do when the maximum message size between your phone and your watch is 120 bytes? What does it mean to create a useful app for your watch? This entry was posted in Evernote, Pebble on October 28, 2013 by damian. In 1984 the author William Gibson penned his first book, called Neuromancer, and inspired a generation. In it the protagonist navigates through cyberspace. If you don’t know what cyberspace means, you are not alone. At the time that William Gibson wrote Neuromancer, nobody else knew what it meant either. He invented the term. Cyberspace in that book was a virtual reality. An immersive computer generated world which when you are in it, feels just like the real thing, beamed directly to the brain via a neural interface. Our imaginations were fired. We wanted it so badly. Looking back, I’m not even sure why, but man was it cool. There was no way anything like it was possible then. A personal computer could barely output color, let alone create that kind of world. Time passed, and by the 1990s my generation still hadn’t forgotten the dream of Neuromancer. Computers and computer graphics were getting more and more powerful. You even started to see video arcades with games with virtual reality headsets. I still remember the day I tried one on, sickly smell of cigarette smoke, music from the arcade games pouring in my ears, almost as loud as the pounding of my heart. This was it, I was going to experience Virtual Reality. I placed the headset on my head, and looked around as it projected images into my eyes. The disappointment was devastating. Not only did it feel like I was wearing a dustbin on my head, it was so clumsy and heavy, but the experience was terrible too. Clunky objects drawn as outlines, which struggled to be re-drawn as I over my head around. The virtual reality dreams of a generation were dashed on those arcades, as I and many others consigned the idea of virtual reality to the dustbin. Time passed. Whole new business sprang up, such as Amazon. Not only did new business spring up, but new ways of doing business sprang up too. In the old days if you had an idea for a hardware product, such as some kind of electronic gadget you’d need to go to a big company to get it funded. Endless bureaucracy and meetings. You’d likely have to give up the rights to your product, and compromise your soul in order to get something like your idea to market. But the internet and the world wide web changed that. Now, when someone has an idea for something, such as a new watch, they can go to sites such as Kickstarter, and pitch their idea not to a committee in a bureaucracy, but instead they can pitch their idea to the world. They can describe what they want to make, what their experience is in the field, what it will cost to bring it to the market, and they can let thousands of individuals invest in their idea, in return for a sample of the product if it ever gets made. The Pebble watch I’m wearing right now started on Kickstarter. Their goal was to raise 100,000 dollars to bring it to market. They didn’t raise 100,000 dollars. They raised 10 million dollars. So that’s one thing that happened”": decentralized “crowd funding” as it is called, a new way of bringing products to market. The other thing that happened is mobile phones: Incredibly powerful miniature computers that we all carry in our pockets. Because they are being made in massive quantities the costs of the components that go into them has dropped massively too. And those components are interesting. These phones have small, but incredibly high resolution screens. They have a vast array of sensors in them, such as gyroscopes so that they can tell when they have been turned, accelerometers to tell when they are moved, and magnetometers to tell which direction they are facing. Can you imagine what would happen if you took those screens, attached them to some kind of a helmet, like ski goggles, included the sensors from phones to accurately track your head position, and hooked them up to a computer to generate slightly different images on each screen? You’d have a virtual reality system. As it happens, someone in the states did have that idea. Someone that knew enough about virtual reality headsets to put together a working prototype. If only they had some way to bring their idea to market. Of course they did, and the Oculus Rift Kickstarter was a massive success. Those that have tried them on have been astounded by the results. It creates a truly immersive virtual reality experience. Anyone who was wondering what value virtual reality can possibly have beyond games need only watch a 90 year old women trying them on, screaming with joy, walking around an Italian villa, leaves blowing in the wind, butterflies flittering in the air. There are plenty of people who for one reason or another are unable to travel, or even to move, yet they can experience the world through virtual realty. School kids can watch the birth of the universe, or chemical reactions happening, and step into the reaction to see it from different perspectives. This technology is still young. 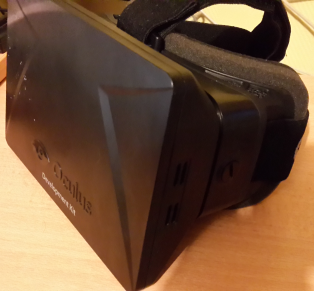 The Oculus Rift is still not publicly available. Its only available to software developers who wish to create for it. But its coming. I’ve talked about the ski goggles, but what about the sick bag? 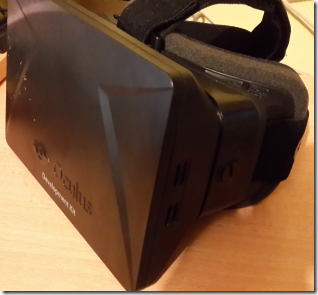 Well all is not perfect with the Oculus Rift. Many people report nausea after trying it on for a while. Perhaps its the eye strain, or perhaps the image still isn’t moving quite fast enough and the body senses that. I’m sure that they will lick the nausea, and soon, very soon indeed, you too will be visiting new parts of our world, or even other worlds, in virtual realty. This entry was posted in Uncategorized on October 27, 2013 by damian. Disclaimer: Although I do work for Evernote, this is my personal opinion. 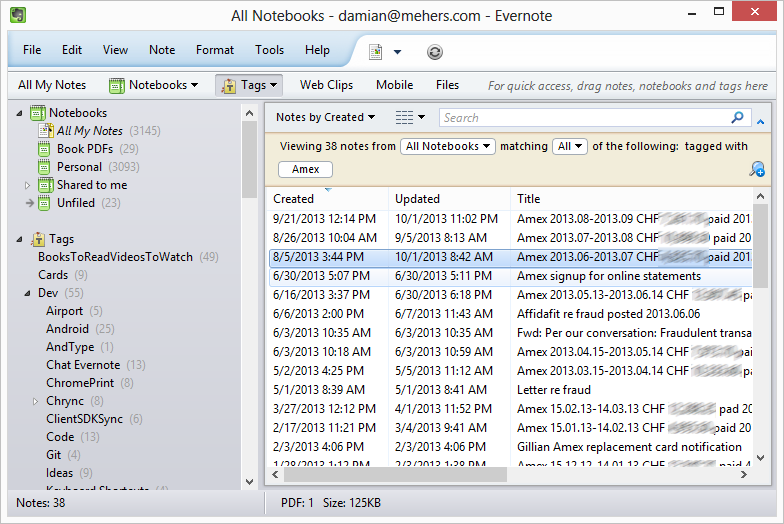 I believe there is no one true way to use Evernote. 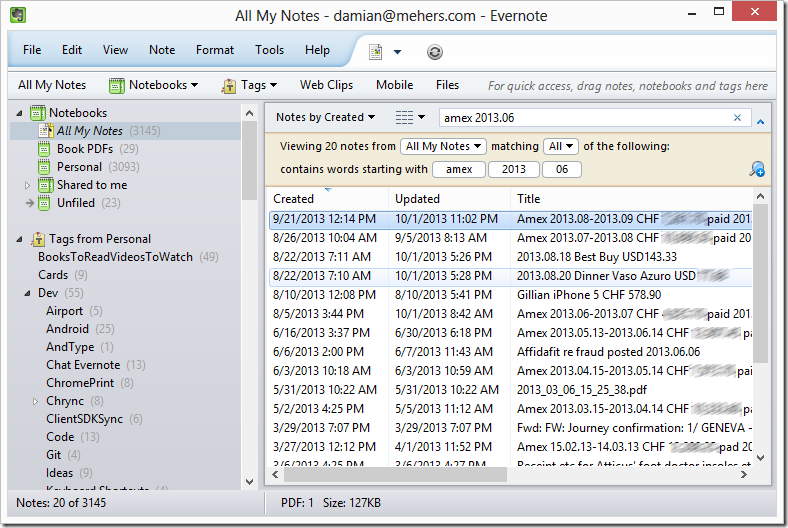 What matters is that however you use Evernote, it should work for you. 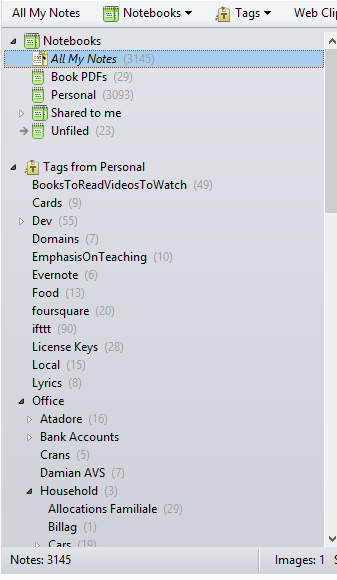 I only have a couple of Evernote Notebooks, but I have many Tags. When I moved from using Microsoft Outlook to Gmail, my eyes were opened. No longer did I have to think about which one folder I should select to file an email, instead I could use Gmail Labels to file a single email into as many "folders" as I liked. I feel the same way about Evernote Notebooks and Tags. Why on earth would I organize my notes into Notebooks, when I can use Tags to the same thing, and more? 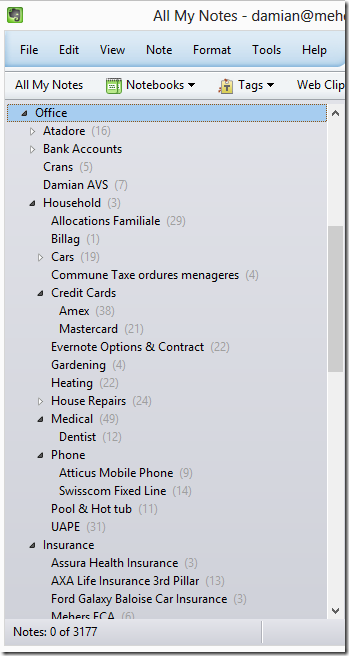 With Tags I can file a note into multiple Tags, and Tags can be organized hierarchically to many levels. 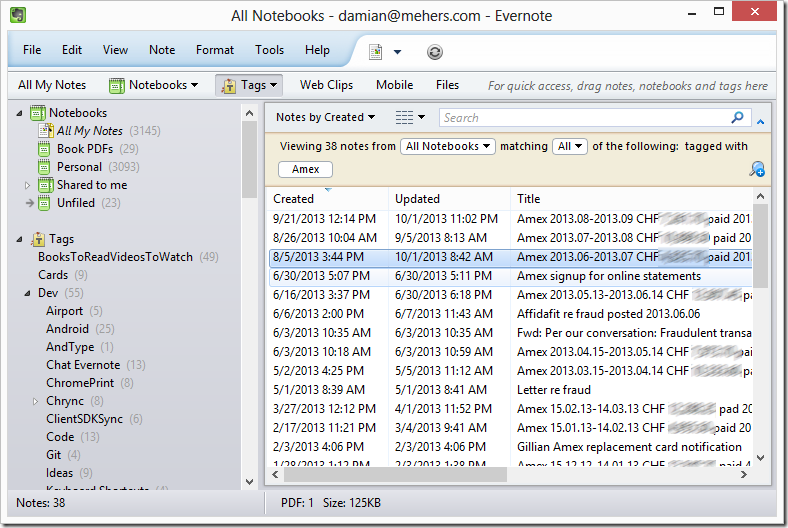 Why would I persist in thinking of Notebooks as being note "containers" and Tags as being "metadata", when they are both virtual concepts – Evernote may well store my notes in physical "notebook" files, but it is just as likely that the note’s notebook is just another attribute, similar to tags. To me they are both containers, its just that one kind works well for me. Tags are so much more powerful than Notebooks that I’m hard-pressed to think of many reasons to prefer Notebooks over Tags. To me Notebooks are clunky, whereas Tags are elegant. Notebooks are good for just two things for me: grouping content to be shared, and to group content I want to make available offline on mobile devices. For everything else I use Tags. But first, a step back. Why would I want to do any organizing at all? Certainly with Gmail my initial enthusiasm for filing my emails quickly dissipated as I got into the habit of simply archiving emails, relying on the coupling of essentially infinite storage with powerful instantaneous search to quickly find old emails. If this works so well for Gmail then why not for Evernote too? As with Gmail, Evernote places no limit on the size of your Evernote account (although there are monthly upload limits, and individual notes have limits), and its search capabilities are legendary. 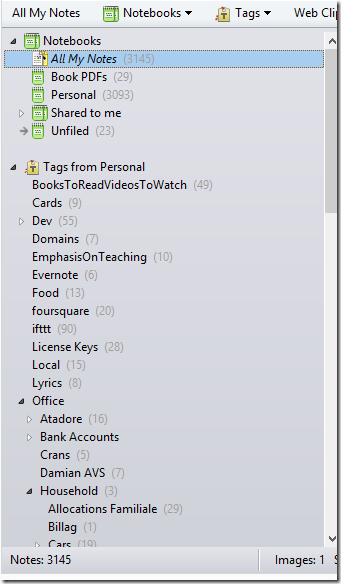 So why do I persist in using Tags for Evernote? I definitely don’t tag all my notes, maybe 70% of them. And tagging notes costs me time. It takes time to choose the right tag, and apply it. Why would I invest this time? One answer is that investing this time upfront saves me time in the future, for certain kinds of notes. When I tag my notes I’m betting that that investment will pay off later. If it didn’t pay off, then I’d stop. If I’m searching for my June 2013 Amex statement, I have to invest the time to think about how to formulate the search string that will find that one for me, and then spend time scanning through the mixed bag of results and try to find the right one. Can you see it? This makes it much quicker for me to find certain kinds of notes: Notes that I’ve categorized. There is another benefit, perhaps purely psychological, but a real benefit nonetheless. 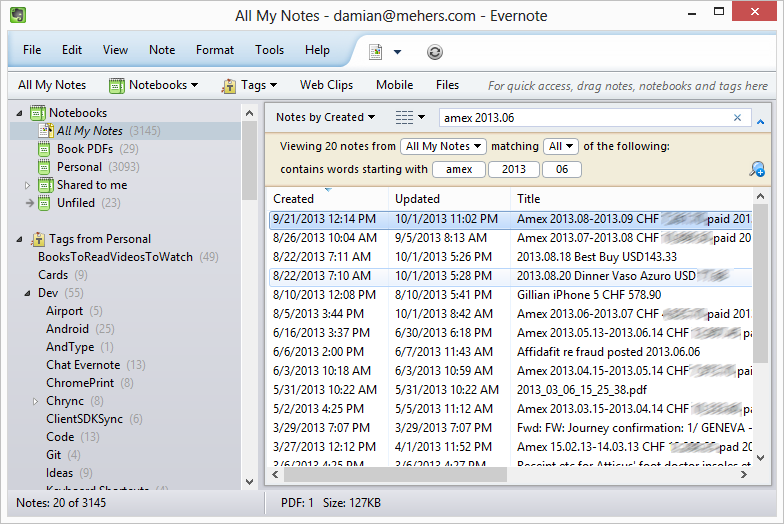 At the start of 2012 I went paperless, and replaced binder after binder with Evernote. The physical binders did have one advantage though – I could pick up a binder and quickly see their contents. I could quickly see all my water bills, my kids school reports, my 2013 bank statements. To replicate this in Evernote I use Tags. Here is my “Office” Tag hierarchy, which replicates the set of physical binders and categories within those binders, that I used to have in my office. Of course with Evernote Tags it is much much better. I can file something in both the “Gardening” tag and the “Household repairs” Tag – something I could never do with physical folders. 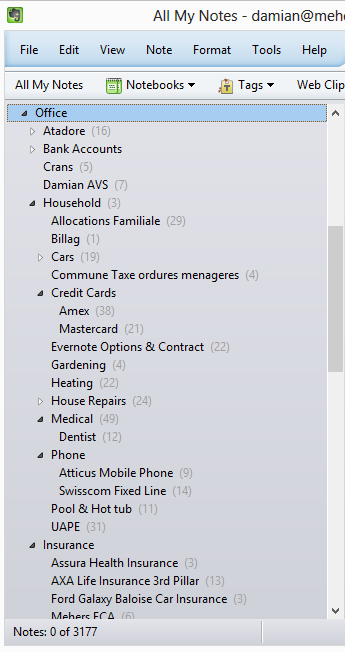 In addition any of these notes in my “Office” Tag hierarchy can also be tagged with cross-cutting tags, such as “Tax 2013”. That way I can quickly and easily find all my notes related to my 2013 taxes, no matter where they sit in the “Office” Tag hierarchy. Investing in tagging some of my notes works well for me because it helps me find my notes quickly, and it is comforting to be able to see my notes grouped together in the same way as they used to be grouped in physical files, before I went paperless. Whether tagging is worth it for you depends to a large extent on what makes you tick. Are willing to throw stuff into Evernote and rely on its search capabilities, or do you want to invest up-front to make searching simpler? Does it bother you to just see a mass of notes, or do you like to see some structure? There is no one true way – just whatever works for you. This entry was posted in Evernote, EvernoteTip on October 13, 2013 by damian. I was at the speaker’s dinner after speaking at the excellent Reaktor conference in Helsinki, chatting about our favorite authors, and rather than just sending an email to the people that were there, I thought I’d instead write a blog post. Good authors are hard to find. These are books I’ve enjoyed over the last couple of years, culled from my Audible and Kindle accounts, skipping over many many “meh” books. Bing links brought to you courtesy of Gmail. Where the Red Fern Grows by Wilson Rawls, about a young boy growing up in the Ozarks and his relationship with his dogs, the land and hunting: A great book for kids 10+, but I loved it too. If you are not crying at the end then you have no soul. Masters Of Doom by David Kushner, about the people behind Doom. Not so much about technology, a lot about personalities. This Immortal by Roger Zelazny: I read it long ago, and it isn’t as good as Lord of Light, but he conjures a believable, flawed, real world. 14 by Peter Clines: very well written, a little loose at the end, but a great read. The Dangerous Animals Club by Stephen Tobolowsky: very very funny. Stories I only tell my Friends, by Rob Lowe: a raw, enjoyable, autobiography. Patrick Rothfuss’ Kingkiller Chronicles. If you’ve not consumed these, do so, now. Flowers for Algernon by Daniel Keyes: an older book that I’d somehow not read but should have. Poignant and worth reading. The Speed of Dark by Elizabeth Moon: beautifully written, not sure how I feel about the ending, and that is as it should be. Way Station by Clifford D Simak: another re-read but classic. Espedair Street by Iain Banks: for me the best of his non sci-fi books. The Dog Stars by Peter Heller: a really really really well written book. It is post-apocalypse, but its not just that. Read this. How to be Black by Thurston Baratunde: uncomfortable reading at times, which says more about me than Thurston, but an insight into his life, what his mother did for him, what he did for himself, and how we should treat others, black or white. Room by Emma Donoghue: recommended by Scott Hanselmann on one of his podcasts. Didn’t know what I was in for, but I am so glad I read this. Don’t be put off by the subject matter. This entry was posted in Uncategorized on October 5, 2013 by damian.